For the past weeks, friends and fellow bloggers in Manila have been sharing Instagram photos of Coke bottles. However these are not ordinary Coke bottles, mind you. It has their name on it and that got me really intrigued! What is going on back home?! After asking a few friends, I found out that Coca-Cola Philippines is running this awesome campaign called #ShareACoke and they've been going around the country with their special vendo machine that magically creates these personalized 500ml bottles of Coke! Since I'm miles away from Manila, my dear friend Trixie was so sweet to create these bottles for us! 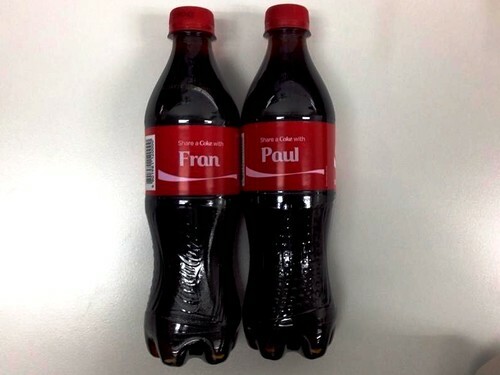 It's our very own Paul & Fran Coke bottles! Yahoo! 1. Buy Php. 150 worth of Coca-Cola® products. 2. Go to the Share a Coke® booth with your receipt. 4. Get your personalized Coca-Cola® from the Coke® Vending Machine (P150 worth of single receipt purchase is equivalent to 1 Coca-Cola® 500ml PET; maximum of 4 bottles per receipt per day). * Remember that there's a character limit of 8 per name. 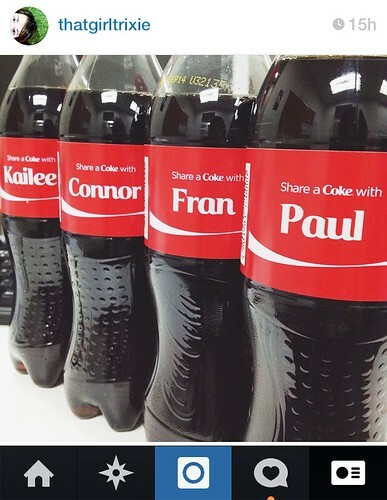 If you want to have your own bottles too, catch the #ShareaCoke Tour as they're down to their last 2 weeks, I believe. For more details on their upcoming visits and the full mechanics, follow Coca-Cola Philippines on Facebook.